Upgrade your home stereo, wired HI-FI speakers, or wired headphones with Bluetooth technology, and free yourself from the tangle of audio cables.The HomeSpot Bluetooth Receiver supports the AAC, SBC, Qualcomm aptX and aptX Low Latency codecs which deliver premium CD quality audio. Built in with Bluetooth 4.2 (backward compatible with 2.1+EDR) technology lets you connect to most Bluetooth enabled devices without draining your batteries. Freedom to move freely in your house as you listen, conveniently control and stream music from up to 66 feet / 20 meters away. The receiver connects to your home stereo or speakers using the included RCA to 3.5mm audio cable or 3.5mm aux cable, and the included power adapter connects to your standard wall outlet. Simply plug it into your stereo, then connect to your device with just one press of a button. The HomeSpot Bluetooth Receiver enables two users to connect simultaneously via MultiLink / Multipoint Technology. Once connected either user can play the music stored on their phone via the stereo system. Two HomeSpot Bluetooth Receivers can be connected to each other to create a true wireless connection. You can stream audio to both speakers via Bluetooth for synchronized video-audio playback. Pair your device with one press of the convenient pairing button. Auto-reconnect to last paired device during power-up. The re-pairing is instant and automatic for hassle-free experience. BLUETOOTH ADAPTER W/ APTX LOW LATENCY - enjoy superb wireless convenience without sacrificing audio quality. Enable any non-bluetooth audio speaker system / hi-fi / amplifier with Bluetooth 4.2 audio streaming technology. Now, any music system in your home can connect to your devices and stream music with the Bluetooth Music Receiver by HomeSpot. EASY SETUP - effortless way to get HD sound quality from your device to any music system. just 3 steps, connect the receiver with the included cables and power adapter, the Bluetooth Receiver will automatically go into pair mode. On your device, turn on Bluetooth and select "GT-BT-Receiver" to pair and connect. Play your music. Easy as pie! SUPERIOR ACOUSTICS - Most Bluetooth products do more harm to the audio and are not usually very inspiring with limited range adding to your frustration. 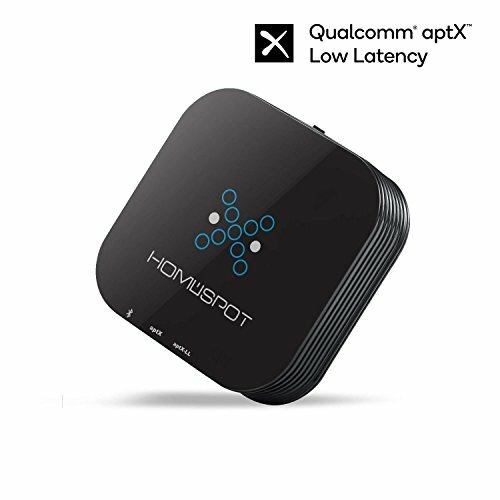 The HomeSpot Bluetooth Receiver with aptX Low Latenc eliminates these issues by utilizing the aptX codec, which is a high quality audio converter designed specifically for audio. HomeSpot Bluetooth Receiver is equipped with multiple advanced audio codec including AAC, SBC, aptX and aptX-LL. LOW LATENCY DELAY - the latest aptX Low Latency technology eliminating lip-sync issues to give you the smoothest audio/visual experience available. To enable aptX LL, you need a separate aptX LL enabled transmitting device such as HomeSpot Bluetooth Transmitter to pair with the Receiver. Not all Bluetooth transmitters support aptX LL coding. Please order the HomeSpot Bluetooth Transmitter (search for B00QV77XU6) to make sure the highest standard requirement. VERSATILE EXTENSION - The HomeSpot Bluetooth Receiver also has special circuitry and a precision tuned built in antenna to extend the wireless range up to 30M, providing much more versatility than other Bluetooth receivers. The Receiver has two high quality 3.5mm jack that operate as analog outputs. Any audio system with a standard analog audio input can connect to HomeSpot Bluetooth Receiver with the supplied 3.5mm-RCA or 3.5mm auxiliary signal cable. If you have any questions about this product by HomeSpot, contact us by completing and submitting the form below. If you are looking for a specif part number, please include it with your message.